Exquise Lime Halter-Neck Jumpsuit. A stunning wide leg jumpsuit featuring a cross over neckline finishing in a halter-neck. The addition of a tie detail mid back adds some interest. Perfect for a wedding or for the races – this bold colour will be sure to turn heads! 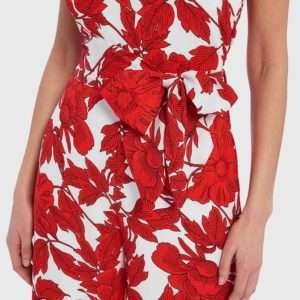 Forever Unique White And Red Floral Print Halter-Neck Jumpsuit. 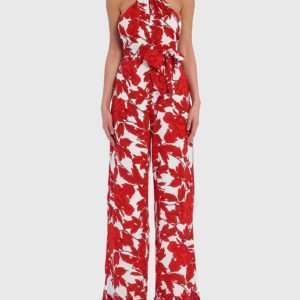 This gorgeous wide leg jumpsuit should be in everyone’s wardrobe this summer! The cross over halter neckline is extremely flattering and features a backless design. The addition of the fabric tie belt allows definition at the waist. And the bold floral print makes this a show stopping jumpsuit, suitable for any special occasion. Forever Unique Blue And Pink Printed Satin Maxi Dress With Batwing Sleeves. This is the perfect summer dress for any special occasion. This longline satin dress features a ruched bodice and open batwing sleeves. Complete with a cut-out back and adorned in a brush print design, this dress is made for a summer wedding. Or kick off the heels and throw over a bikini to be the most glamorous person at he beach party. Anoola Vanilla Bardot Dress with Contrast Trim. A stunning knee length crepe pencil Bardot style dress. The bardot neckline is in a contrasting fabric and also has detachable shoulder straps for extra support and coverage. The addition of the godet panel to the back gives a modern touch to this classic style. A perfect easy to wear but extremely memorable dress for your special occasion. Gabriela Sanchez Pale Pink Flute Hem Dress Organza Jacket. Gabriela Sanchez pale pink flute hem dress and organza jacket. A simple tunic style dress with featured flutted hem at the rear in a high low shape. The reverse style organza jacket is beautifully embroidered in lace applique detailing. The jacket has a drape effect at the back and fashionable raised wide collar. Perfect choice for Mother of the Bride, Groom, races day or special social event.